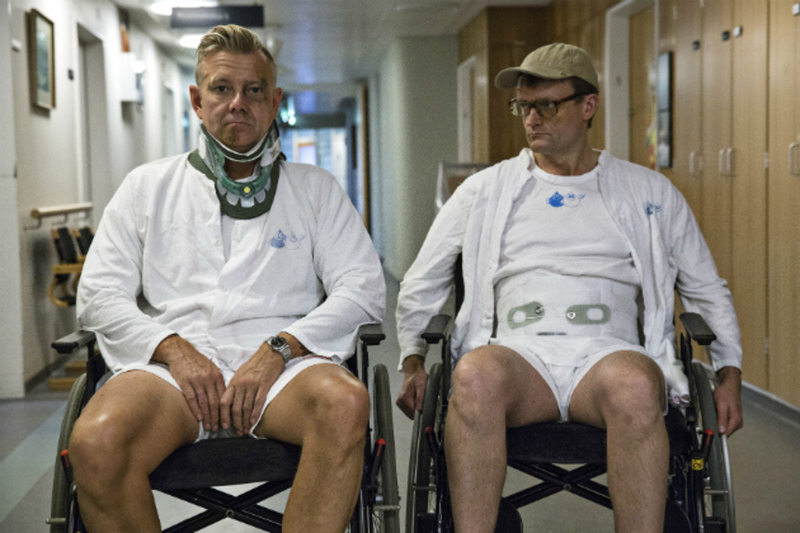 Four years ago, Klown (original Danish title: Klovn) blew into worldwide cinematic consciousness as a wickedly funny, perversely smutty, and utterly original comedy. Born on a television series, Frank (Frank Hvam) and Casper (Casper Christensen) are longtime friends, constantly led into ridiculous situations by their own personality traits. Casper is the magnetic one, ready to plunge into new waters on a moment's notice, while Frank tends to hold back before joining Casper, although his self-control is never too strong. In the years since the original movie, Frank and Casper have been famous in Denmark, and are preparing to publish a promotional book about friendship, a friendship that is now on the rocks. Frank has gotten married to his longtime girlfriend Mia (Mia Lyhne), has two young children, and has settled into a routine suburban lifestyle. Meanwhile, Casper's marriage to Iben (Iben Hjejle) has ended in an acrimonious divorce. Casper feels shut out of Frank's life, and so he decides to pursue his entertainment career in Hollywood without discussing it with Frank first. Just when one might think that Klown Forever won't possibly "go there," it smashes through the "forbidden" sign with great glee. When, for example, Frank rents a car at the airport and is told by the agent, 'As long as you don't go to South Central, you'll be fine,' we know that Frank and Casper will be heading to South Central, leading to an outrageous episode involving two women that skirts an offensive line before becoming little more than a silly excuse for more sexual humor. That was one of the great joys of the first movie, and it remains true for the sequel. In practical terms, everyone who saw the first movie has lost their virginity, and there is no replicating that hugely comic experience. Yet Hvam and Christensen, who improvise the dialogue based on a detailed storyline, and director Mikkel Nørgaard, who guides them and helps shape their performances through visually-distinctive settings, take a bit more time to meditate on the nature of friendship and the lasting value of relationships between men who are not necessarily sexually attracted to one another. Friendship can be a funny thing, and Klown Forever makes the most of that platitude, producing a very, very funny movie with a good bit of genuine heart. Casper And Frank Return In KLOVN FOREVER! Let The Rejoicing Commence!